Hot on the heels of a successful spring launch at Amberleigh Coquitlam, Morningstar Homes is now launching Kingston Coquitlam single family homes. Located at the well sought after Foothills of Burke Mountain Coquitlam community, the new presale Coquitlam Kingston single family homes by Morningstar (by the way, our favourite local home builder) features an amazing location at Kingston Street and between Queenston Avenue and Galloway Avenue. Close to Coast Meridian Road, David Avenue, Pinetree Way, Lougheed Highway and Coquitlam Centre, but far enough away for peace and tranquility, the single family homes at Kingston Coquitlam by Morningstar are geared towards professionals, families of all sizes and downsizers. For those homebuyers who are familiar with the Amberleigh boutique community, Kingston Coquitlam is further east by a few blocks. Some of the defining features of the new Kingston Coquitlam single family home project is in its location at The Foothills of Burke Mountain. Most of the homes in this boutique project will feature oversized back yards that will border along a protected green belt green space. This is very hard to come by in the Lower Mainland, but these Burke Mountain Coquitlam Kingston homes will certainly give you that opportunity in purchasing a well situated home that is ideal for families. The spacious floor plans are also some of the best we have seen at The Foothills of Burke Mountain, giving homebuyers plenty of space, flexibility and choices. The natural setting of the Kingston Coquitlam home development is undeniably rare, and each home will give you the privacy and tranquility that you seek in an established neighbourhood. 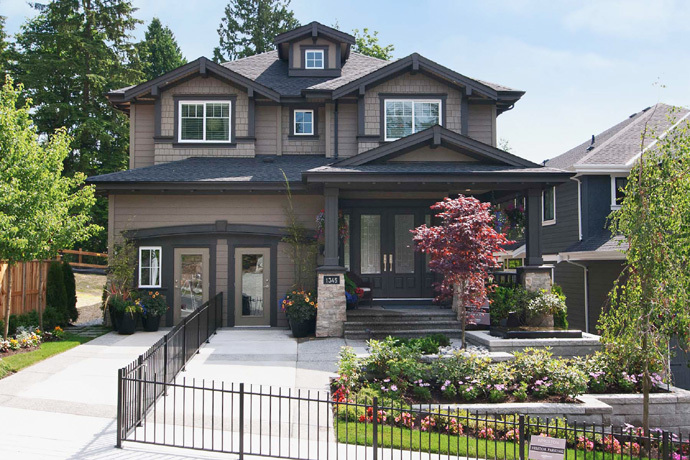 From the professional landscaping to the high-end cedar fencing, the Kingston Coquitlam Morningstar Homes are by far the best in the area. This is a must-see! If you want more information about Kingston Homes in Coquitlam’s Foothills of Burke Mountain neighbourhood, please visit www.mstarhomes.com today or visit their display homes to speak with a sales representative! If you are staying away from attached living, townhouses, triplexes and duplexes, the detached Coquitlam homes at The Foothills of Burke Mountain is an obvious choice. The Kingston by Morningstar Homes provides Coquitlam home buyers with only 26 opportunities to purchase a dream house. Each of the homes at Kingston Coquitlam is situated on a premium homesite/lot that offers the most back yard space possible. Imagine the possibilites for outdoor living! 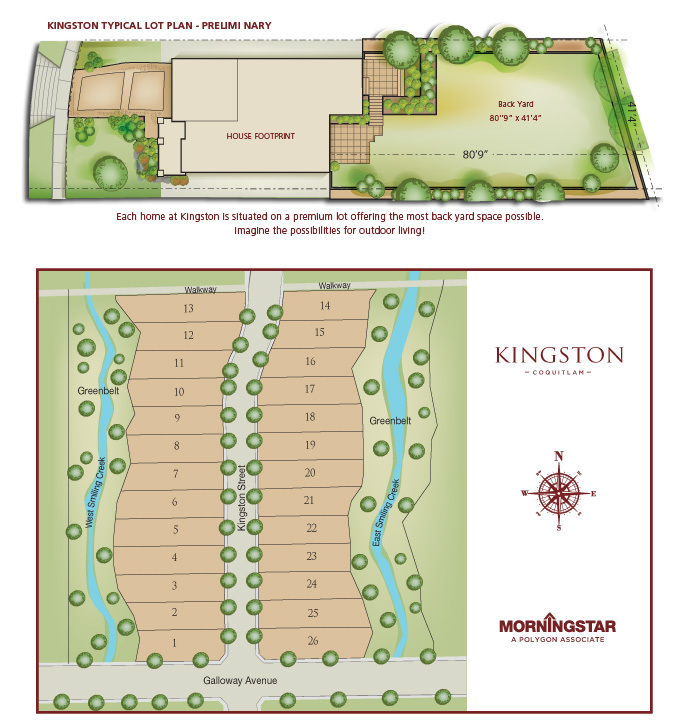 The preliminary Kingston typical lot plan is posted on their web site. There are 2 main floor plans available at The Foothills of Burke Mountain Coquitlam Kingston detached home community. The first is called the Emerald Floor Plan which features 4,341 square feet of living space over 3 levels. The main floor plans features the main living space with amazing custom designed and outfitted kitchen, great room with fireplace, foyer, den and veranda. The upper floor plan features an ‘open to below’ area, three bedrooms PLUS the master bedroom with vaulted ceilings, his/hers double walk in closets and a master ensuite with a central tub, separate walk in oversized shower, toilet room and double separate vanities! There are also 3 options for basement layouts/finishings at the presale Coquitlam Kingston detached homes by Morningstar. The first is to leave the basement unfinished. The second option is to have the deluxe finished basement plan that includes a rec room, media room, full bathroom, large bedroom, store room and a second recreation room. The last option for The Emerald floorplan at the presale Coquitlam Kingston detached homes at The Foothills of Burke Mountain is a legal suite basement plan (2 bedrooms plus 1 bathroom, full kitchen with island). Plus you still get a rec room for yourself plus storage space! The Sapphire layout at Kingston Coquitlam detached homes at Burke Mountain real estate market features another impressive and well thought out floor plan by Morningstar Homes. Here, you will find 4,365 square feet of impressively large living space plus a large back yard and front porch veranda! The main floor again will feature the main living areas, den, kitchen, great room and garage whilst the upper floor plan again will have the 3 bedrooms plus master suite. The difference is that there is 1 large walk in closet and the bathroom has double vanities on one counter. There are again 3 options for homebuyers at the presale Coquitlam Kingston detached homes for sale for the basement: unfinished, deluxe finish with 1 bedroom and 1 bathroom or a Coquitlam legal suite layout with 2 bedrooms and 1 bathroom. In any case, the basement is a walk out. Each of the Kingston Coquitlam detached homes will feature four very large bedrooms and at least 2.5 bathrooms. The great room is one of the most impressive architectural features of the Kingston Coquitlam Burke Mountain homes with generous overheight 19 foot ceilings! There is also a floor to ceiling linear fireplace that makes the room even more impressive and a great place to entertain. The kitchens at the presale Kingston Coquitlam Morningstar homes for sale will feature huge granite central islands as well as oversized windows throughout the homes that fill the interior living space with lots of natural light. The master bedrooms are also another great feature at the new Coquitlam Burke Mountain Kingston homes with private balconies that overlook the back yard as well as ensuite bathrooms that are truly spa inspired in every way. Other fine craftsmanship and detailing by Morningstar for the Foothills of Burke Mountain Coquitlam Kingston homes includes Kohler fixtures, premium hardwood floors and stunning glass railings.